The popularity of the spoken word is evident in the powerful performance arc that threads through the 16th edition of Poetry Africa. Music is also a prominent presence in this landmark festival organised by the Centre for Creative Arts (University of KwaZulu-Natal) and made possible through principal funding from the National Lottery Distribution Trust Fund. Poetry Africa runs in Durban from 15 to 19 October at the Elizabeth Sneddon Theatre, with the festival finale at BAT Centre on 20 October. Satellite events take place in Malawi, Zimbabwe, Botswana and Cape Town before culminating at the main event in Durban. Sure to stir up a storm is Saul Williams, whose innovative work as an actor, poet and musician continues to break new ground on arts stages around the world. The proficiency and originality across different artforms which have established Williams at the cutting-edge of creativity provide a riveting fusion of voice and music artistry on matters of heart, mind and social conscience. Well-known for his breakout role in Slam, Williams has appeared in over ten films and starred in the Senegalese-shot film Tey,which showed at the recent Durban International Film Festival. 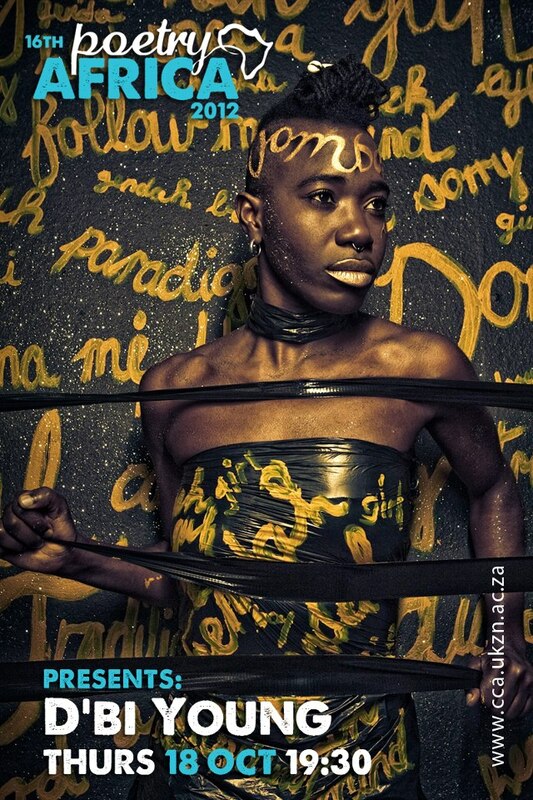 Local audiences will be introduced to the avant garde approach of dynamic Jamaican dub poet, prolific playwright, monodramatist and educator D’bi Young, fresh from a TED talk programme in India. Star of the South African hip-hop scene, well-known for imaginative collaborations with artists from a range of disciplines and genres, Tumi will showcase his distinctive individuality, this time without the Volume. There is Cameroon-born Werewere Liking, a legendary poet, musician, painter and cultural activist who established the Ki-Yi artist village in Ivory Coast and top Swedish hip-hop artist Henry Bowers who is also recognized as one of Europe’s leading slam-poets. Bowers is part of a contingent of performance poets coming from Ordsprak Festival in Uppsala, Sweden that includes Oskar Hanska, Sam Kessel, Solja Krapu and Laura Wihlbörg. Another popular participant is Ewok, not only one of South Africa’s sharpest wordsmiths but also also one of the busiest, active as MC, playwright, actor, teacher, organizer with the LifeCheck movement, and part of hip-hop outfit Illuminating Shadows. The lineup also includes Poppy Seed, a singer and spoken word artist from the UK with a number of cds and poetry publications to her credit;Mbali Vilakazi, who won a gold medal at the recent Poetry Olympics; Gouslaye, a colourful performance poet from Reunion Island;Croc e Moses who combines a guitar and voice approach to his poetry; talented Durban poet Tumelo Khoza who is also organizer of the Cup O’ Thought poetry sessions; and the brilliant Niels Hav from Denmark, whose perceptive poetry is lined with delicious irony. With a background in journalism Tolu Ogunlesi’s poetry offers a broad personal reflection on life in contemporary Nigeria and beyond, while Nii Ayikwei Parkes of Ghana, is a sought-after socio-cultural commentator whose poetry embraces themes of power, cultural conflicts, love, and the friction between capitalism and humanism. Poet and novelist Philo Ikonya was President of the Kenyan chapter of PEN when she suffered brutal arrest for speaking out against corruption and the clampdowns on freedom of expression in Kenya, and is now based in Norway. A previous member of the Soweto Gospel Choir, the powerful voice of Jessica Mbangeni has significantly contributed to raising public interest in imbongi praise poetry, and from Cape Town comes Rustum Kozain, whose finely- crafted poetry has earned him accolades such as the Ingrid Jonker Poetry Prize and the Olive Schreiner Award. Poetry Africa is enriched with an intertwining of music and poetry that sees the participation of people whose reputations are well established in music circles. Apart from the afore-mentioned artists, many of whom straddle a variety of disciplines and genres, the programme also includes Madosini, the foremost exponent of the various bow instruments that form part of Xhosa culture – she is a crucial custodian of these traditions. Originally from Spain, Pedro Espi-Sanchis has become a local (and international) legend for his African story-telling and expertise on indigenous music instruments, especially the Lekgodilo pipe-flute. Very special guest is the legendary Zimbabwean Oliver Mtukudzi – “Tuku” turns 60 this year, which is matched by his incredible output of no less than 60 albums. The festival finale will feature the mesmeric groove of Vavangèr(s), a music project led by Sergio Grondin with Maya Pounia and Alex Soress, honouring the legendary Reunion Island musician Alain Peters. There are also special cameo performances by Madala Kunene with Zos Kunene, Guy Buttery and Nibs van der Spuy, and Zimbabwean mbira duo of Isaac Machafa and Praise Zinhuku. High-paced action is assured in this year’s SlamJam. Now in its 11th year this popular event will see a crossing of word-swords as teams from South Africa and Sweden square off at Bat Centre on 20th October. The Swedish team is represented by Henry Bowers, Oskar Hanska and Laura Wihlbörg ; South Africa by Ewok and Dashen Naicker (both previous SlamJam winners), and PAGE, who won the Cup O’Thought slam-off to earn a place on the team. 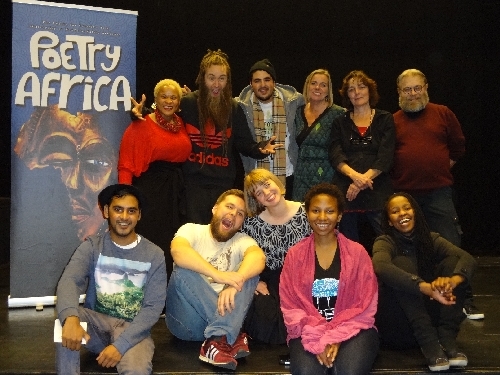 The Swedish contingent is coordinated by the Ordsprak Festival in Uppsala, with whom Poetry Africa has had a relationship since 2006. In this year’s exchange Lebo Mashile, Lefifi Tladi, Tumelo Khoza, Dashen Naicker and Ngwatilo Mawiyoo (Kenya) will represent Poetry Africa at Ordsprak in late September. Since the passing of enigmatic Dennis Brutus in 2009, Poetry Africa has each year invited a poet who reflects similar passion for human rights and activism as Dennis. Referencing his famous poem Letters to Martha, written while Dennis was in prison, the participation of the invited poet will include a poetry presentation under the title of Letters to Dennis. This year’s Brutus poet is the highly deserving local activist Ewok who is also a Brutus Scholar at the the Centre for Civil Society, UKZN. Following Poetry Africa’s participation in Sweden a series of performance showcases take place in Blantyre (6th October), Harare (8th and 9th), Gaborone (11th) and Cape Town (13th) with workshops, panel discussions and schools programmes in some of the centres. The core tour group includes Pedro Espi-Sanchis, Ewok, Philo Ikonya, Madosini, Nii Ayikwei Parkes, with D’bi Young also participating in Malawi and Zimbabwe, Lebo Mashile in Botswana and Cape Town, and Saul Williams in Cape Town. Festival book launches include Rustum Kozain’s new release “Groundwork” (Kwela Books/ SnailPress), two books by Allan Kolski Horwitz “Two Birds at My Window” and “Meditations of a Non-White” (both Dye Hard Press), the long due Zulu version of Oswald Mtshali’s “Sounds of a Cowhide Drum”, “Imisindo Yesighubu Sesikhumba Senkomo” (Jacana), and the Sol Plaatje European Union Poetry Anthology Volume 2 (Jacana). Book launches take place at the Wellington Tavern Deck, Elizabeth Sneddon Theatre, from 18h45-19h15, prior to the evening showcases. The Sol Plaatje European Union Poetry Award will be presented on Thursday 18 October – the finalists are Vonani Bila and Siddiq Khan. Poetry Africa provides a space for intercultural exchange and dialogue in wide-reaching day activities that include seminars, workshops and poetry performances at tertiary institutions and community centres, engagement with local poetry groups, open mic opportunities and visits by the poets to thirty schools in Durban and surrounding areas to exchange poetry and ideas about poetry with young learners. Visit www.cca.ukzn.ac.za for the full programme of activities, biographies, and photos of participants or contact the Centre for Creative Arts for more information on 031 260 2506/1816 or e-mail cca@ukzn.ac.za. 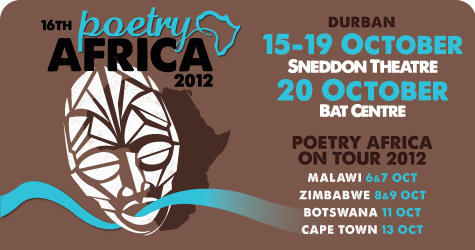 Follow the festival on Twitter @PoetryAfrica. Organised by the Centre for Creative Arts (University of KwaZulu-Natal), the 16th Poetry Africa International Poetry Festival is supported by the National Lottery Distribution Trust Fund (principal funder), Humanist Institute for Development Cooperation (HIVOS), Swedish Arts Council, France South Africa Seasons 2012 & 2013, and the City of Durban.